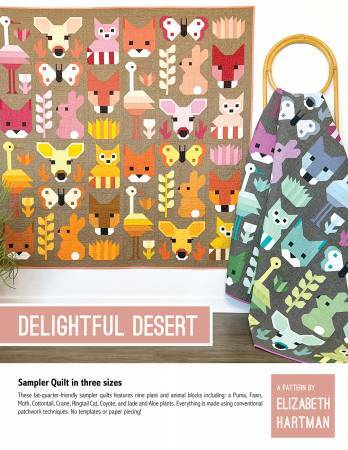 Delightful Desert is a fat quarter friendly animal sampler quilt made using conventional patchwork piecing techniques. This pattern is similar in format to my Fancy Forest and Awesome Ocean sampler quilts and includes nine new plant and animal blocks that can be used to make three quilt sizes. Sample quilts feature my Terrarium Fabric Collection for Robert Kaufman Fabrics.